Welcome to the New Guilford County Beekeepers Association web site. We are a chapter of the North Carolina State Beekeepers Association, the largest state association in the United States. We are located near the geographical center of North Carolina, in the Piedmont region of the State. We will be working to improve the site as we go along, so stay with us and watch us grow. 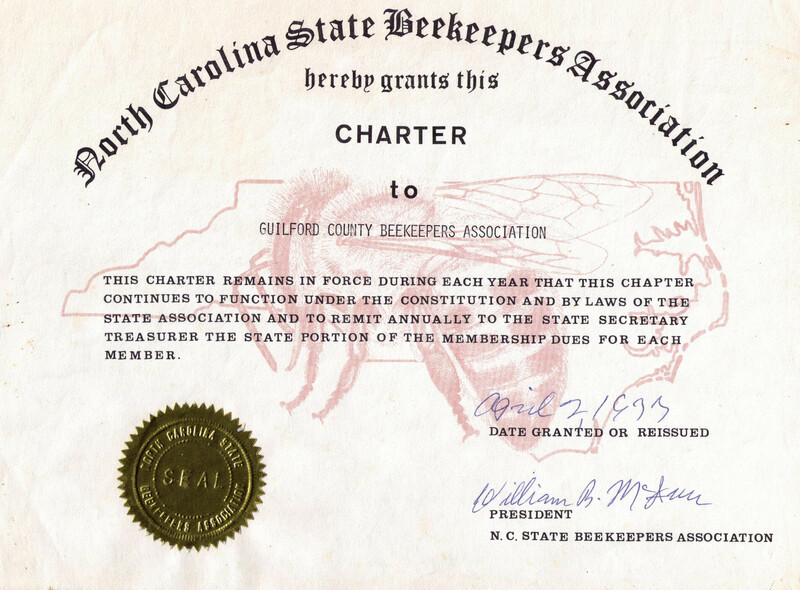 The Guilford County Beekeepers Association met on April 10, 1975, and voted unanimously to organize and request affiliation with the North Carolina State Beekeepers Association. Twenty-two members met, and in addition to voting to organize, elected the first set of officers. Our earliest Charter located is dated April 2, 1977. The Guilford County Beekeepers Association is a not-for-profit organization dedicated to assisting current and future beekeepers in North Carolina, as well as promoting public awareness of the benefits, necessity, and value of the honey bee throughout human existence.